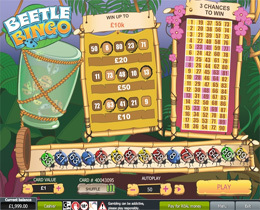 Beetle Bingo is an animated scratch bingo game developed by Playtech that revolves around a number of beetles in a jar. With every new card you can hit “Scratch All” and your numbers will immediately be revealed and all the beetles will fall out of the jar. If one of the beetles matches a number on your card, then that number will be circled on the card. You can win up to $100, 000 by playing Beetle Bingo if you bet with the maximum bet of $10 per card and have all 5 numbers matching on each of the 3 rows on your card.